Product prices and availability are accurate as of 2019-04-20 00:57:14 EDT and are subject to change. Any price and availability information displayed on http://www.amazon.com/ at the time of purchase will apply to the purchase of this product. 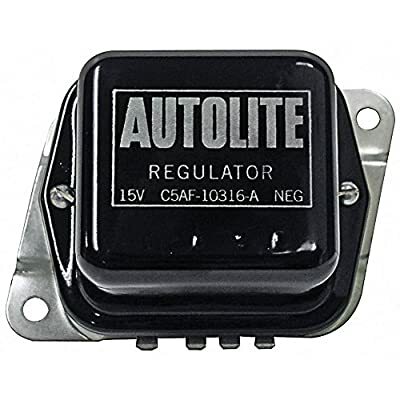 This new reproduction engine voltage regulator fits 1965-67 Falcon, Comet, Ranchero, Mustang, Thunderbird, Galaxie, Fairlane; 1965-67 F-Series pickup truck after 12/64. All with 38/42 amp alternator and without air conditioning. This quality reproduction has a black cover with "AUTOLITE" in silver. NOTE: Electrical parts are non-returnable once installed. We will replace defective units only. Made in the USA.